An NUI Galway graduate has recently opened a new social enterprise café on Augustine Street in Galway. Sitting in the bright, airy Temple Café, I spoke with Sebastian Taylor about how the business operates. “How it works is we run as a normal business and the profits that we generate in the year go towards local charities,” he explained. The café is furnished with palettes or old furniture converted into tables and chairs, everything painted by Sebastian and his team. There is a calm, relaxing atmosphere in the café, helped along by the soothing singing of Norah Jones in the background and the smell of fresh coffee wafting through the premises. Sebastian’s idea to start the social enterprise café was inspired by a number of things. He volunteered with SERVE in 2013, going to the Philippines with them, which he said opened his eyes to a whole new world. “I volunteered with them in 2013. That was a great experience so that’s where I really started wanting to do more charity work,” he said. 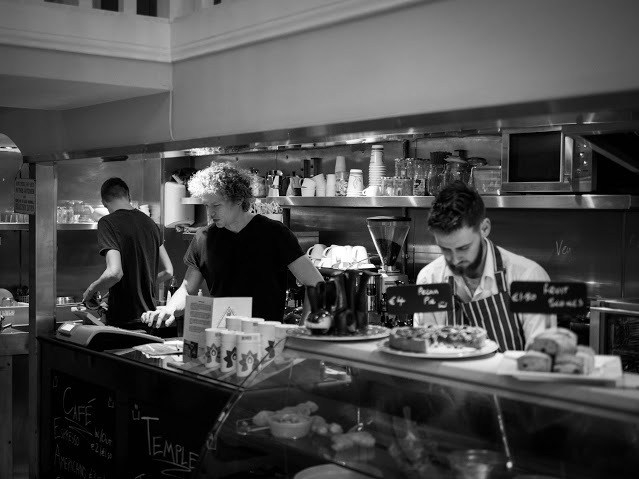 A café in Edinburgh, the Social Bite, also inspired his work today: “After I finished my degree in NUI Galway I went to do a masters in Amsterdam and was there for two years and then after that I went to work as a recruitment consultant in Edinburgh – so for the last year I lived in Edinburgh and while working out there I was across from a coffee shop called Social Bite,” he continued. He said he also had heard a little about the concept of social enterprises from learning about Mohammed Yunus, the man who came up with the idea of social business and who won the Nobel Peace Prize in 2007 for it. “When I started talking to the owners of the Social Bite, I started reading his book and the more I read the book the more it made sense,” he said. Sebastian began working on his plans last July, putting menus in place and by November his father, his partner in the business, had found an ideal location in Galway for him to set up shop. Other charities have shown interest in the café too and Sebastian is hoping the café will work with different charities throughout the year and organise events to raise funds and awareness as much as possible. Sebastian explained the how important the link with charity is for him and how raising awareness around suicide is one of his missions with the café: “I’ve lost a few friends through suicide and members of my family,” he said. “So you know, it’s affected a lot of people. Recently when they were having the Prime Time debate with the leaders and they were talking about suicide, they were saying if you’re under fifty, the most likely cause of death you have is suicide in Ireland,” he said. And the name Temple Café? “More so than anything, it is about treating your body as a temple,” explained Sebastian. “So when I was in Edinburgh I left my position as recruitment consultant and I started working with Edinburgh Leisure and that’s when I started really learning about nutrition and sports development and everything like that and I started eating really healthily,” he said. The café sources a lot of local produce with an emphasis on health options: “We do a lot of vegan and vegetarian options,” said Sebastian. The café also does its own ‘Roughies’ – breakfast in a smoothie form – and student lunch deals, with soup and ‘proper’ sandwiches. Temple Café can be found on Augustine Street.